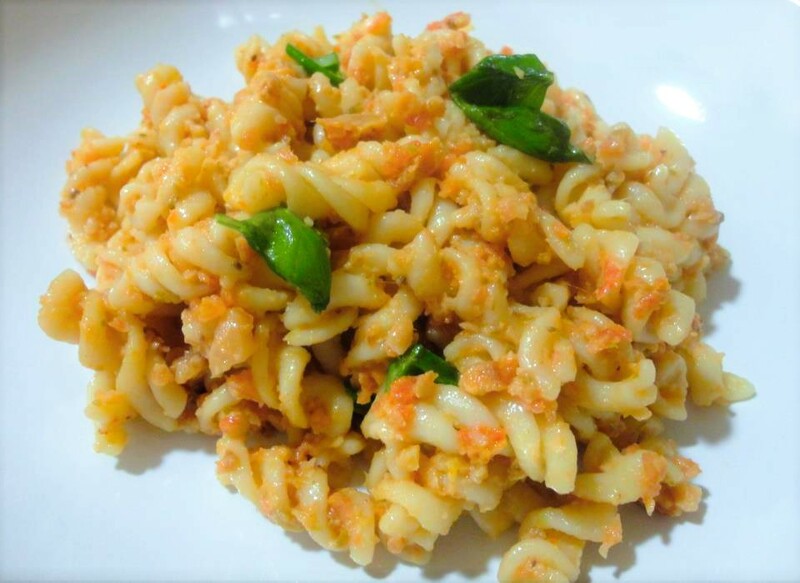 I am on a budget and wanted to cook something new and affordable so the obvious choice was a dish with pasta - something I always have in the pantry. OK, so the extras I needed did motivate a little shopping, so I ran to the local supermarket that had exactly what I was looking for. This is a super simple, humble dish which asks for very few extra ingredients. If you don´t have them then go on, get up and out to buy them - it´ll be worth it You will not be disappointed with the results. 1. Fill a pot with plenty of water. Wait for it to boil before salting it. Add fusilli lunghi and cook according to packet instructions. 2. While the pasta is cooking, prepare the sauce, without the basil for now by placing the ingredients into a food processor and blitzing. 3. Before draining the pasta take a take 2 tablespoons of the boiled pasta water and pour down the funnel of the food processor pulsing as you go. 4. Drain the pasta and tip into a warmed serving bowl. Pour and scrape the sauce on top and toss lightly to coat. 5. Serve with the basil leaves scattered on top.